We are the remarkable entity, engaged in offering a superior range of Industrial Enclosure to our valued clients at very affordable rates. Suyash Engineers & Automation Pvt. Ltd.
- Completely modular & fully bolted concept with unmatched flexibility. We are engaged in offering a wide range of Industrial Acoustic Enclosures that are designed to reduce noise pollution created by industrial equipment. We use bonded mineral wool as per the IS 8183 & BS 3958 standard having density of 64, 96 110 kg /m3. With strong intentions to uplift our repute in this industry, we are engaged in offering a quality assured Industrial Control Enclosure. We are offering the high-quality collection of Industrial Enclosures to our valuable customers. Rax- Tech International offer a complete know how in the field of electronic packaging. 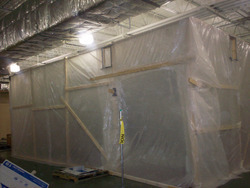 - Enclosures protect emitters/receivers and corner mirrors from dirt, chemicals and impact.